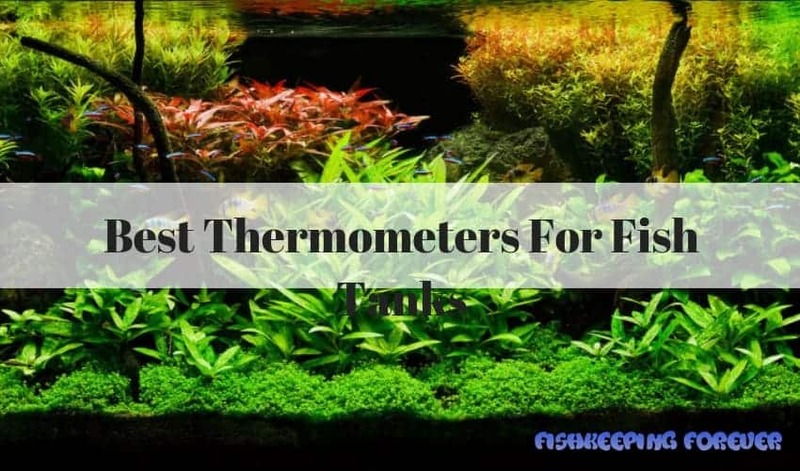 Best Thermometers For Fish Tanks - We reviewed them all. 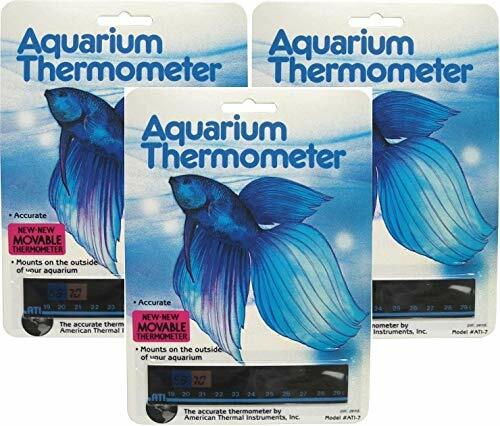 Blog Best Thermometers For Fish Tanks - We reviewed them all. Although there are not many things that you have to foresee when you are buying fish, you need to know some of the basic care needs. Fish need to be fed and kept in perfect water conditions. They also need to be kept under a specific water temperature which can change depending on the type of fish you keep and the region they come from. Some fish can survive warmer waters while others are capable of living in cooler conditions. So before you bring your fish home, make sure you research them properly so you can provide the correct environment. After doing your research and you have a clear idea about the temperature you need to keep the water in your aquarium at, you must buy a good thermometer. Aquarium thermometers are different from the ones you usually own to check the temperature of your body. Different brands produce these thermometers at different prices. The qualities vary as well. You must buy a product that can cope with immediate changes in the temperature. Fish are sensitive and cannot survive long in temperatures they are not accustomed to. We understand everyone has a budget hence the wide variety we have reviewed from the very basic to the best LCD ones. 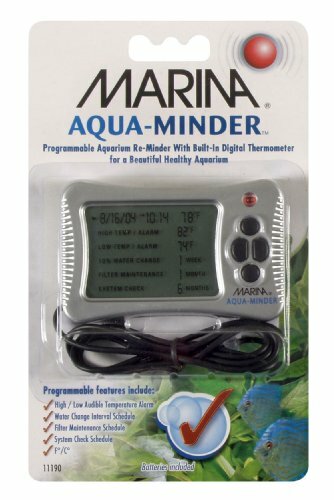 The Marina Floating Thermometer is a unique product. It is smaller in size than the other things available in the market so you can fit it into your aquarium easily. If you have a few fish and your tank is small in size, you should go for this product. The thermometer has suction cups installed at the top. These allow for easy reading of the temperature. The thermometer floats around in the tank so you can get the temperature of every corner separately. It has a marked safety zone which indicates a limit after which the temperature must be brought down. The size of the thermometer is 4.25 inches and the transparency allows for greater clarity in reading. If you are looking for a thermometer that requires no extra effort in recording and reading the temperature than the Zacro LCD Digital Aquarium Thermometer is the right one for you. This digital thermometer is exactly what is required by people who are in a hurry to record temperatures. It comes with a probe that has to be submerged in water. The probe is connected with a wire to the thermometer. Even if you are not close to the aquarium you can set this probe inside it and your work will be done. The design of the thermometer is compact and you can carry it with you easily. However, the display is large enough to be read by anyone. – The cell needed to power the thermometer needs to be changed frequently. The American Thermal is a unique thermometer because it is installed horizontally. Unlike most of the other products which are designed to be read vertically, this is much easier to read and comprehend. The thermometer is installed at the side of the aquarium. You can pick the side which is clearly visible and put it over there. The results are very accurate. 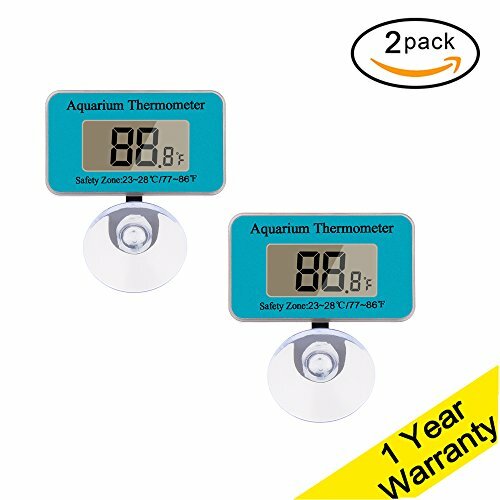 This basic but very popular type of aquarium thermometer is one of the best selling thermometers used world wide. Simply because it’s cheap and easy to use. Compared to the other products available in the market, this thermometer costs less while giving you exactly the same quality. It is not widely popular because moving it in the aquarium is a bit tough. Once you install it you need to use tools to take it off and then install it somewhere else. – A bit expensive as compared to the other thermometers available in the market. 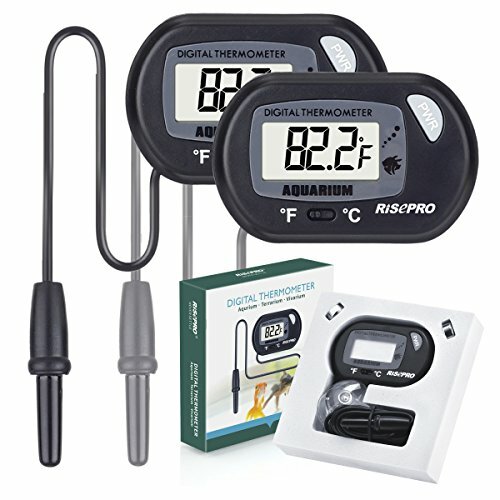 The Risepro Aquarium thermometer is an excellent choice for people who do not have time for installation. It takes a few minutes to set up and you can place it outside the tank. It comes with a probe that goes inside the aquarium and collects the temperature of the water. It is a simple mount display that can be kept on any side of the tank. The wide range of temperature and the accuracy that is offered by this thermometer is what makes it one of the best in the market. You can also switch the temperature from Celsius to Fahrenheit according to what you think is easier to understand. Moreover, this thermometer is good for use in aquariums, which have other reptiles living in them. 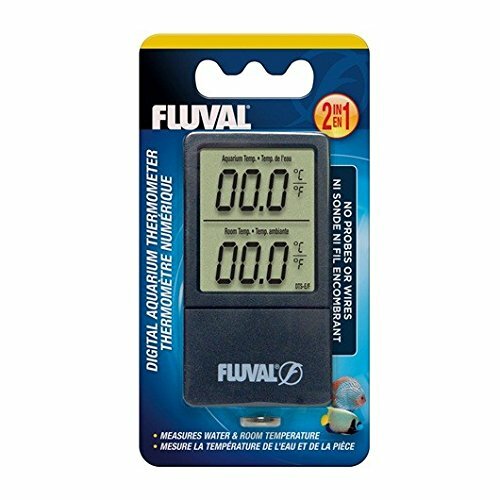 In this world of technology with a demand for equipment that can operate easily and that you do not have to understand in depth, the Fluval Wireless Digital thermometer is a blessing. For those of you who do not have enough time to manually operate you’re the thermometer for your fish tanks, this item will be the best. It comes with a big size LCD that allows you to read the temperature even from far. There are two temperatures which are recorded- the water temperature in the aquarium and the surrounding room temperature. You can place the display on the side of the fish tank. It is extremely easy to set up. The thermometer is best suited for freshwater and saltwater tanks. 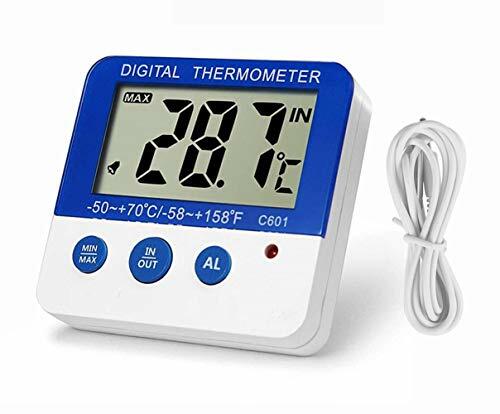 It is also highly accurate with correct displays within 10C/20 F. Moreover, it comes with a warranty that makes this thermometer one of the most feasible in the market. – The large display makes it easy to read the temperature even from far behind. – There is no need to use probes with this thermometer. – It uses a battery to operate which means the battery needs to be changed after a while. 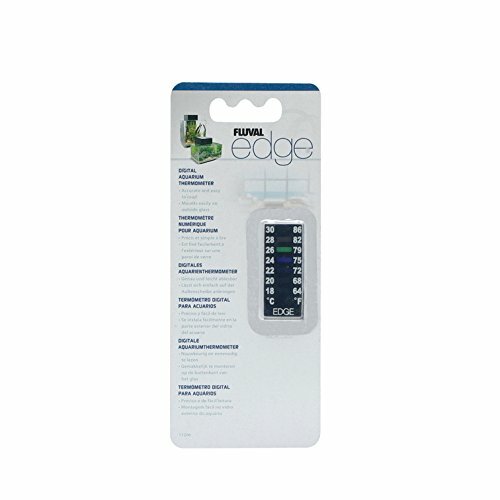 One of the simplest and easiest to read thermometers is the Fluval Edge Digital Aquarium Thermometer. It is traditional in the sense of its design and its overall function. It does not use any high technology so anyone can install and use it. For most people, this thermometer is the favorite as they can rely on it. It comes with a wide range of temperatures written in Celsius and in Fahrenheit. The thermometer is mounted on the glass casing of the fish tank. It sticks easily and even after years of use, does not fall off. The best use of this device comes when you use it with fresh and with salt water. 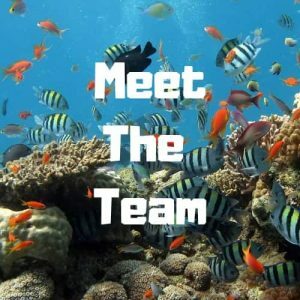 It can cater to all types of fish tanks easily. – The display is big enough to be read by anyone with weak eyesight. – Once gets damaged, it cannot be repaired and used again. 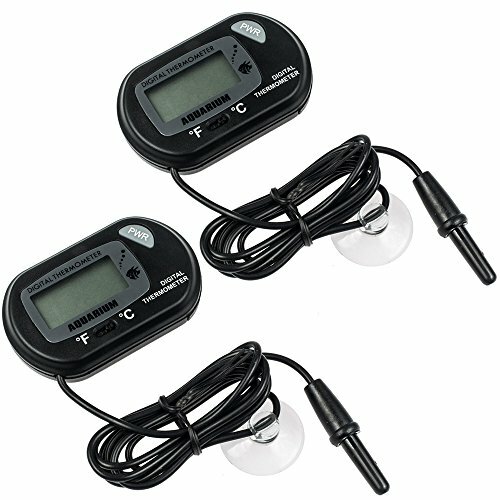 One of the most stylish aquarium thermometers available in the market right now, the DaToo thermometer is unique in its design and overall look. It is made in blue plastic with a transparent lining that protects it from external damage. The design is kept simple and no extra colors are used to highlight the LCD. There are also no extra controls and buttons added on the thermometer. It reads the temperature automatically and displays it immediately. This thermometer can be immersed in water. It is waterproof so there is no chance of any damage. There is a suction pad attached at the bottom which makes it suitable for placing on the sides of the tank from where you can clearly see the display screen. There is a wide range of temperature which you can see on this thermometer. – One of the simplest thermometers to use available in the market. – Compared to the quality, the price is very low. – It is easy to read and requires no additional effort. – The suction pad can get loose with time so it would have to be replaced after a while. This square digital Thermometer is essential for Aquarium Fish Tanks. Very clear and accurate temperature readings with this miniature digital thermometer which has a simple design and easy to read LCD display. It has has a range of -58°F to + 158°F(-50~70C). It has a double alarm function with LED indicator to alert you to an issue. Highest/Lowest Temperature Alarm Function with LED light flashing for 5 seconds. When the real temperature goes too low or beyond the requirements the alarm temperature range you set, the alarm with light occurs every minute. Various ways to attach it to or near the tank. Standing on a table or Attached to the steel surface(with backside magnet) or attached to the outer wall of the aquarium with the Velcro. Bright and modern design make this a cheap but reliable thermometer for your aquarium. It comes with a 1-year warranty. 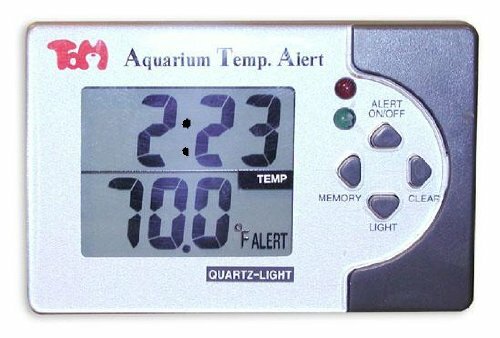 The KollerCraft digital thermometers for aquariums is suitable for measuring all high and low temperatures. It comes with an audio quality which will read the temperature out loud after it is recorded. This makes your work easier as you do not even have to be present near the fish tank in order to know the temperature at a particular moment. There is also a LED display that sends you an alert if the temperature is crossing limits you have set in the thermometer. It comes with a plastic probe and suction cup for ease of use. The setup is simple and very direct. There is no need for instructions. The thermometer can be used in fresh water and salt water aquariums and it lasts for a few years without any damage. – Sends immediate alerts if the water temperature reaches a dangerous level. – It is easy to use and to understand. – It is one of the most durable thermometers in the market. – The weight of the thermometer is a little more than the others available in the market. he Marina Aqua-Reminder provides aquariums with continuous monitoring of temperature, as well as a routine maintenance schedule. The Aqua-Minder flashes and beeps when a maintenance function is due (water change, filter maintenance) and/or the temperature has dropped or exceeded the programmed values. This product is ideal for reminding people with busy schedules, or those who are a little forgetful to care for their aquariums. Marina Aqua-Reminder helps keep aquariums healthy and beautiful. Great for people like me who forget to do water changes and other maintenance. Some people say it’s reading was 5% out. We didn’t find this. All tropical fish tanks need a thermometer, it just depends on your needs and aquarium setup to which one you buy. If you simply want an accurate temperature reading then most of these will do. Some people don’t like sticking one on the front of their lovey aquarium so they may rule these ones out and others don’t want to float one inside the tank where larger fish might bash it around. So that narrows it down to a digital LCD with a small probe that can be placed inside the tank, or in a sump tank or filtration unit at the back of the tank. Just ensure the one you buy is reliable and accurate. Most offer a 1-year warranty so if you find it’s not suitable or accurate you can send it back and get your money back. We hope you liked this simple post about aquarium thermometers. It’s just a simple review to show you there are more types than you might have thought. Let us know which one you buy or which one you already use. We love to hear your feedback.